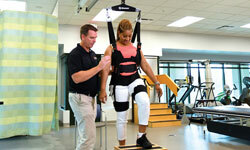 Vector system provides safety, security and support for neurological and physical rehabilitation patients. Patients at UF Health Rehabilitation – Emerson are now able to complete a full range of motions with the Bioness Vector System. 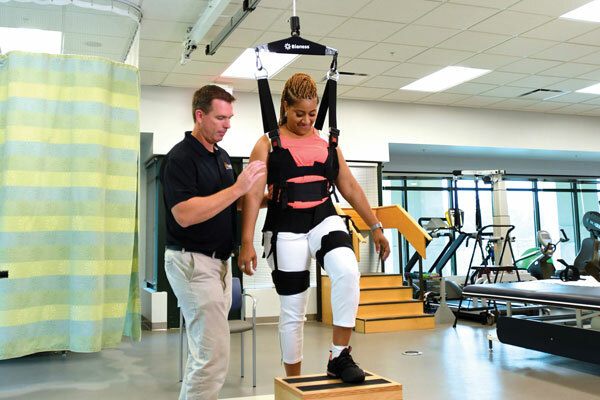 The vector system suspends a patient below a robotic trolley that moves with them and holds them up using a harness, which incorporates two shoulder straps that are attached to an overhead bar. UF Health Rehabilitation – Emerson is the only location in Northeast Florida with the vector system. Therapists use a wireless control unit to assist patients, and even tweak the treatment, as they move. The harness is so secure it can pull patients up out of their wheelchairs and into a standing position. If a patient falls, the harness will catch them. Casanova says the vector system has been extremely beneficial for patients with Parkinson’s disease or those who are recovering from a stroke because it allows them to practice larger movements. The vector system can hold up to 500 pounds and loops on a closed track configuration. There are multiple settings to help provide real-world experience for adult and pediatric patients recovering from stroke, amputations, and orthopaedic, brain and spinal cord injuries. UF Health Rehabilitation – Emerson is a 10,000-square-foot facility that includes two gyms filled with the latest, specialized equipment for orthopaedic, sports rehabilitation and neurological balance training. Visit UFHealthJax.org/rehabilitation-services for more information. UF Health physical therapists say the new vector system is a game changer for rehabilitation patients.